By	Allyson Haymaker. Last edited by Marios Alexandrou on April 4, 2019. 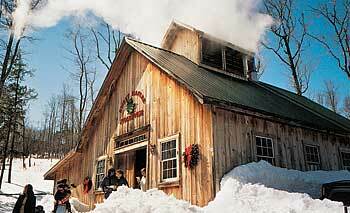 To see firsthand how modern-day maple syrup is made, we enjoy visiting the family-owned Sweet Maples Sugarhouse in Newbury, New Hampshire during March or April. The Sweet brothers — Pieter, Doug and Jeffery–practice the fine art taught by their father, Robert. The sugaring season lasts about 6-8 weeks, when daytime temperatures above freezing and below-freezing temps at night send sap moving up and down through maple trees, creating perfect harvest conditions. The Sweets run 2,300 taps that produce anywhere from 15,000 to 35,000 gallons of sap. That sounds like a lot — until we learned that it takes roughly 40 gallons of sap to make 1 gallon of maple syrup! An automated system boils down the sap until it's concentrated enough to become syrup. The resulting steam is vented outside, where the sweet aroma fills the air. In the boiling room, the brother's wives serve maple-flavored baked beans and hot dogs, plus brownies, cookies, doughnuts, cupcakes and coffee. The brothers also sell maple-syrup products. Newbury is on State Highway 103 in southwest New Hampshire, about 12 miles west of I-89 (Exit 9) and roughly 25 miles northwest of Concord. The Sweet Maples Sugarhouse (694 Hwy. 103) is open from noon to 5 p.m. on weekends. For more information, call 1-603-763-6111 during the season or 1-603/526-4595 the rest of the year. For updates on the sugaring season, call the New Hampshire Maple Phone at 1-603-225-3757.